two sweaters at a time. There’s a big chance that you own a lot of clothes that you don’t really wear. Mostly because they don’t fit well or because of their sentimental value. On average we have 80 pieces of clothes hanging in the closet, out of which 20 have never been worn. 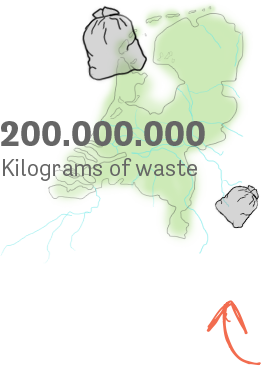 In the Netherlands alone we throw away 200 million kilo’s of textiles every year. That’s enough to fill the closet of 3 million people with enough clothes. On top of that, 30% of the clothes produced never reach a closet, simply because they are not wanted. That’s why we created a fashion brand determined to eradicate fashion waste. Why not use this as a source material and transform it into desired clothing. Designed in a way that you can keep them on your legs for as long as you want? As a side effect this will close the loop of the fashion chain, which contributes to the circular economy. WearPatch is founded by two different designers. Hasmik Matevosyan is a fashion designer and researcher specialized in clothes psychology and sustainable fashion. Samy Andary is a user centred industrial design engineer passionate about creating products that actually matter. We combined our knowledge and skills to reuse fashion waste and create value for you. We believe in a holistic approach when it comes to designing a sustainable product, taking both users and producers into account. That’s why we involved 300 people to co-design our first sweatpants that can be locally produced, the Sunthey! First of all you can choose to throw your clothes in a clothing collector bin, instead of the garbage bin. Secondly you can help us turn as much waste to fashion as possible. Choose to #WearPatch. Order now!